Escape the Phoenix heat at this family cabin, nestled into the pine forests of Arizona’s White Mountains. Crisp and cool in the summer and cozy as a snow globe in winter, it’s an ideal getaway at any time of year. With double-height open-beam ceilings, a stone fireplace and all new fittings, this newly remodeled three-bedroom sleeps 11 and has enough space to give everyone their privacy while providing comfortable common areas for family fun time. After a backyard cookout and a meal around the dining room picnic table, sink into the luxe leather sectional for a rousing game of Pictionary or Netflix on the flat-screen TV. Kids will race to claim their spot in one of six bunk beds—four upstairs and two downstairs, plus a trundle bed, all with access to a full bathroom. The upstairs loft has its own entertainment center and poofy chairs for kids movie night, and the lucky top-bunkers can drift off to sleep while stargazing, thanks to the skylights in the pitched roof. Save the master bedroom for yourself, with its king-sized bed, rustic pine furnishings and private bathroom with shower. A second king bedroom upstairs includes a pack-and-play crib, walk-in closet and treetop views, so you wake up excited to explore the vistas that lie just on the other side of your window. From our gated development, Pinetop Crossing, you have Arizona’s best hiking, fishing and skiing right at your fingertips. Imagine watching the sunrise from your kayak on the placid waters of Woodland Lake. Just a half-hour away is Sunrise Ski Resort, which is even more fun in the summertime, when they set up a climbing wall, zip lines and an epic 30-foot airbag jump. We also love teeing off at Pinetop Lakes Golf Course, horseback riding at Porter Mountain Stables, and taking old-timey carriage rides through the Apache-Sitgreaves National Forest. With all the amenities of home, like free wi-fi, a fully stocked kitchen, and a full-size washer/dryer, it all adds up to an easy-breezy getaway in the pines—the perfect antidote to life in the Valley of the Sun. See you in the mountains! 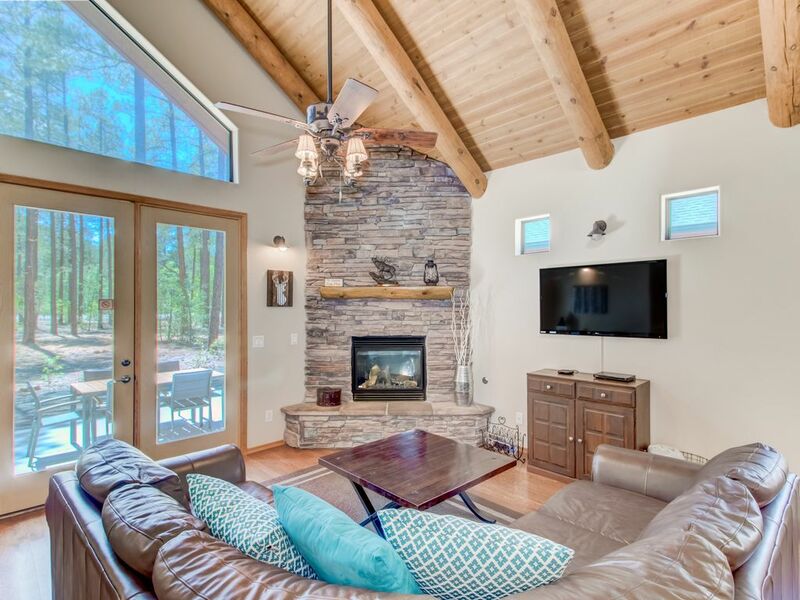 This Pinetop Crossing property was our first vacation home and were lucky enough to have it built the way we wanted it with all the major upgrades. We loved it so much and took time to add nice furnishings so it would be truly like a second home. We were not able to use it as much as we liked so decided to turn it into a business and let others have the opportunity to stay in comfort while away from home instead of a small hotel room. Only minutes to Sunrise Ski Resort and many lakes and hiking trails. Basic cable with Cable One. Strict - No smoking allowed. Property was just as pictured! Had everything we could want. We will stay again. Thank you for staying with us and reviewing! Is the third time I stay there and I just love it! Very spacious, 15min from Ski sunrise resort, all amenities, just perfect. Thanks again Sara! Thanks for choosing our cabin for your vacation again! Property is fantastic...exceeded my expectations! I highly recommend renting this property. Thank you for the review Marlo! This home is beautiful. Perfect for family or multiple families. Kitchen has everything you need to cook. The beds are extremely comfortable. You won’t go wrong staying at this gem. Clean place, lots of room! Wow this place is clean! Plenty of space for everyone to stay comfortably. We did big meals, game night, movie night by the fire, great experience. We've stayed here multiple times and highly recommend! Very comfortable cabin with lots of room! We have stayed here several times and are never disappointed. The cabin is very well represented and described perfectly! Very well taken care of, clean, tidy and well stocked with everything you need. Location is perfect, close to town where there are several restaurants and stores and about 15-20 minutes to the ski slopes. We will definitely stay here again next time! Owners are very responsive to any questions we had prior to booking the first time. The White Mountains along the Arizona - New Mexico border are the second highest range in the state of Arizona. The range is dotted with mountain lakes and streams. Camping and fishing is plentiful in this high mountain area with several stocked lakes, and most years there is sufficient snow for snowmobiling, cross-country skiing and downhill skiing at Sunrise Ski Area. Golf: 18 hole course open to the public. The also have a driving range and putting greens. Ski: This cabin is located in Pinetop Country Club is about 20 miles from Sunrise Resort. Sunrise is a top Arizona destination for skiing, snow-boarding and other winter activities.